It’s time for another baby shower and this time there’s no secret surrounding the little one about to make their grand entrance. Of course, with all that pink, it’s a girl! In a true show of sisterly love, Shikira threw this pretty-in-pink shower to celebrate the pending arrival of her sister Ashiya’s first child. Shikira started planning the shower almost from the moment her sister discovered she was pregnant. And when Ashiya found out her tiny plus one was a girl, there was no stopping the avalanche of pink! Doting aunt-to-be Shikira made so many of the pretty elements you see here herself – the paper flowers, the bunting and even the felt birds, which are now hanging in her niece’s nursery patiently awaiting her arrival. Here’s a tip – Shikira says if you want to tackle your own paper flowers, Ikea napkins work best! She used a free printable from Twig and Thistle for the bunting. Shikira also kept busy baking up a storm. 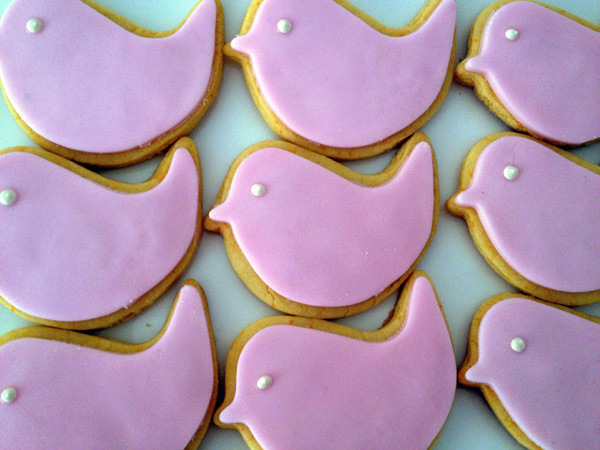 She made the cute bird-shaped cookies, mini caramel tarts, mini strawberry meringues and even the luscious white chocolate mud cake. It took pride of place on the desert table, with its perky ceramic bird topper found at discount department store Target along with the pretty wire bird cages. A gluten free option – delicious cupcakes from Brisbane’s Cupcake Parlour – sat on sweet mini cake stands and were one of only two special requests from the rather easy-going guest of honour, who also asked for a very big jar of piglet lollies! Those pregnancy cravings are so downright unpredictable! 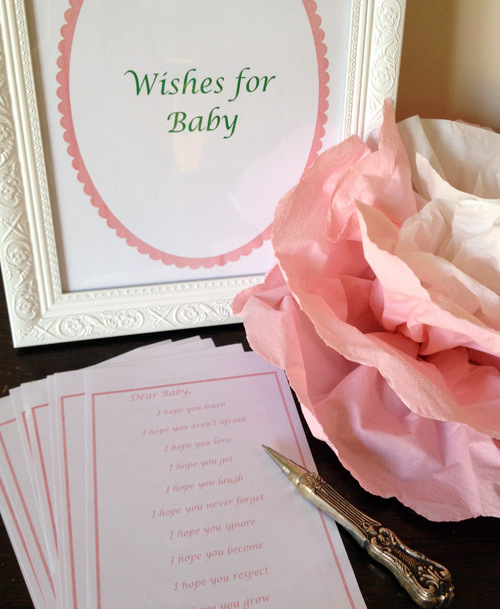 We especially adore this shower idea – each guest was asked to fill in the gaps to complete a list of sentences with their wishes for the baby. Things like `I hope you learn…’, ‘I hope you get…’ and ‘I hope you become…’. What a special keepsake to look back on in years from now, and what a special auntie! Want to share your wow-worthy baby shower with us? Then just fill in this form on our contact us page. While we can’t reply to every email, we’ll certainly let you know if your event is chosen to be showcased on Babyology. We can’t wait to hear from you and look forward to seeing your amazing baby showers!